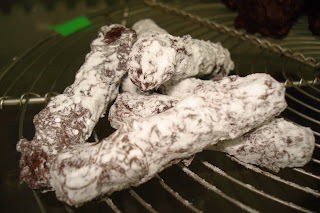 Dark chocolate mixed with cream, cocoa butter, glucose and praline almond which was piped in strips, dipped in dark chocolate then coated with icing sugar. Judging from its appearance, I expected this cake would be as wonderful as the 3 Chocolate Bavarian cream cake. I felt a bit disappointed though after I got to have my first bite. Well, it's only my opinion. Others loved this cake! 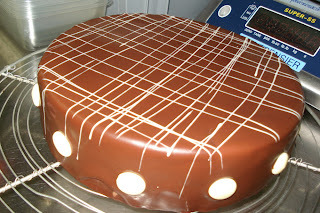 The base was made from chocolate biscuit. 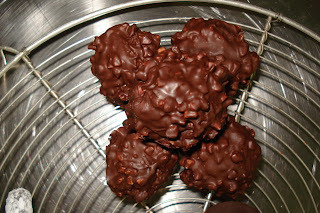 The biscuit was then covered with Rocher base (what is called crispy feuilletine). 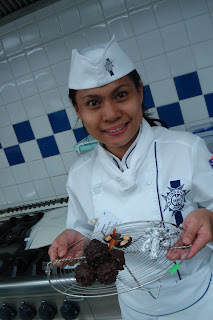 We masked the whole cake with chocolate mousse before we glazed it. Due to the warm temperature of the glaze, it melts the frozen mousse once poured over it. Thus, smoothening the top is quite challenging. So to have a perfectly smooth top, pour the glaze QUICK! As for the decoration, I piped melted white chocolate in loose lattice design and stick the "button" white chocolate on the sides. Our baking skill was once again tested today as we strove to pass the white exam. I have no clue as to what the term really means. All I knew was it was coined by the French. Normally, we had to create a product with our partners. Today was different. We had to do everything by ourselves. I was so anxious I doubted my inability to pass.The reason. My partner and I agreed to alternate doing things (cake,filling, glaze,etc.) 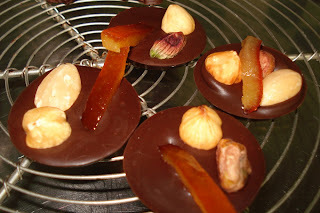 Last time we made our very first "joconde biscuit" (see Opera) Cha, my partner was the one who made it. Before they allowed us to enter the kitchen, I prayed a thousand times. With His guidance, my biscuit turned out good. The difference between Opera and Jamaica is that the latter has cocoa powder added in it's joconde biscuit batter. Before baking, mixed nuts (ground pistachio, almonds) with icing sugar was sprinkled on it. 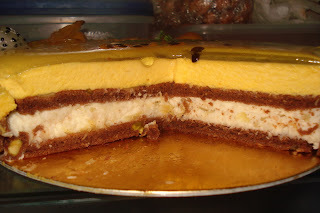 Between two disks of joconde biscuit was a layer of coconut mousse. Inside the mousse you'd find cooked diced pineapple. 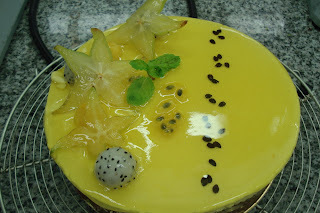 We spread a thick layer of mango-passion fruit mousse over the coconut mousse. We coated the top with neutral glaze and decorated with fruit. Here's what the cake looks like in the inside.